Smartphone lost or stolen is currently commonplace. In such a situation, the biggest difficulty is to lose data. More trouble than this is that no one else misuses your data. There is a way through which you can save your data from misuse of the phone after it is lost or stolen. 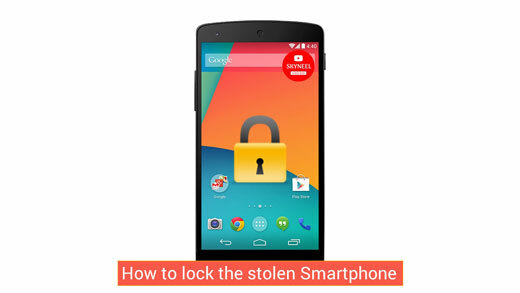 In this article we are going to tell you “How to lock the stolen Smartphone”. Step 1. To lock the stolen smartphone, you first have to open the browser in another phone or computer. Here you will need to type https://myaccount.google.com/find-your-phone-guide. Then click OK.
Must Read: How to download Masked Aadhaar card? Step 2. In the open page you have to enter your Google Account which you are using on your phone. Login with the Google account ID and password. Step 3. After logging in, you will see a list of all the smartphones in which your Gmail account will be logged. From this list, you have to choose the smartphone that you have forgotten the lock password or choose the stolen smartphone. Step 4. Here you will find the option of “Lock Your Phone” Click on it. You have to enter a new password or pin here. Step 5. This will lock your phone wherever it is, and no other person will be able to open it. With this help, You can sign out your Google Account from the stolen phone. You can also erase the phone’s data. Note: Users should note that all their data has been backed up in Google Drive or elsewhere. It is important for all important data to be saved somewhere other than a smartphone. Step 6. However, for this method, your phone needs internet access. In this way you can lock the stolen smartphone. By which the data of the stolen phone will be secure and can also be saved from the misuse of that data. If you liked this article then you can also like our Facebook page and subscribe to our YouTube channel too. If you have any problem related to this article, you can comment and tell us.